Lewis A. King, 88, of Attica, passed away Monday, January 21, 2019, at his residence. Lewis was born November 26, 1930 at home at 14353 East County Road 8 in Attica to the late Vernon and Anita (Angene) King. He married Mary J. (Brown) on August 20, 1950 in Attica and she preceded him in death after 64 years of marriage on May 26, 2015. Other survivors include his children, Steven L. (Donna) King of New Washington, Pamela J. (Donald) Waldock of Tiffin, Kathy L. Ink of Attica, Marjorie (Michael) Long of Tiffin, Ronald (Tammy) King of Attica, ten grandchildren, Keri (Aaron) Brown, Chad King, Kimberly (Jason) Bordner, Amber King , Jessica Long, Jenifer (Nathan) Perkins, Kelly (Justin) Newberger, Jayme (Michael) Laing, Aubrey (Joshua) Phillips, Zach King, four step-grandchildren, Brad (Leslie) Smith, Jake (Ashley) Tidaback, Heather (Jeremy) Skeels, Ed (Brook) Webb, nine great-grandchildren, ten step-great-grandchildren, two sisters, Evelyn Nagel of Willard and Mary Zellner of Chillicothe. Lewis was preceded in death by his parents, wife, Mary, a grandson, James L. Waldock, a great-grandson Jay L. Laing, five brothers, Richard King, Raymond King, Charles King, Kenneth King, Vernon King Jr., a sister, Helen Mae King and a son-in-law, Bob Ink. 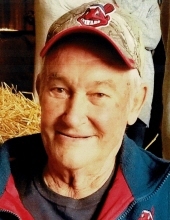 Lewis was a lifelong area farmer. Lewis enjoyed turkey hunting and salmon fishing in Michigan. He was an avid OSU and Cleveland Indians fan. Lewis was a 1950 graduate of Attica High School. Funeral services for Lewis will be held at 12:00 p.m., Monday, January 28, 2019 at the Lindsey-Shook Funeral Home in Bloomville. Visitation for family and friends will also be on Monday, from 10 a.m., until the time of the service at the funeral home. Burial will follow the services on Monday, at Woodlawn cemetery. Memorial contributions may be made to Stein Hospice. To send flowers or a remembrance gift to the family of Lewis A. King, please visit our Tribute Store. "Email Address" would like to share the life celebration of Lewis A. King. Click on the "link" to go to share a favorite memory or leave a condolence message for the family.